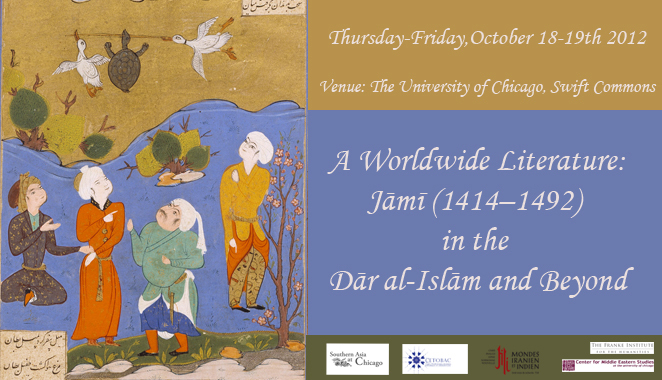 This workshop is part of the of the Neubauer Collegium project A Worldwide Literature: Jami (1414-1492) in the Dar al-Islam and Beyond. It will be the occasion to present and discuss a project of handbook on the conception and reception of the oeuvre of the polymath Abd al-Rahman Jami, and introduce a new online corpus of South Asian commentaries on his works. Hosted by Thibaut d’Hubert (University of Chicago) and Alexandre Papas (Centre National de la Recherche Scientifique, Paris). Special guest and discussant: Sunil Sharma (Boston University). RSVP via the Neubauer Collegium website. Follow this link to read the summary of the Paris conference. The next event of the project will be held in Paris on 14-15 November 2013. This international conference will gather the scholars who contributed to the symposium in Chicago (October 2012) as well as new participants. Please see the program and abstracts of the conference on this website. The first event will take place at the University of Chicago on October 18-19 (Thursday and Friday). Courtesy of the Bnf. Jāmī, Tuḥfat al-aḥrār, Bnf Supp. Persan 547, fol. 17. The second event will be a conference held in Paris in Autumn 2013. After the conquests of Tamerlane (1336–1405) and the monumental urban projects conducted in Samarqand in the fifteenth century, Herat (in present-day Afghanistan) became the centre of the Persian-speaking Muslim world. By commissioning large-scale projects that somehow followed the impulse given by their illustrious ancestor, Timurid rulers changed the course of cultural and political history in the West as well as the East. 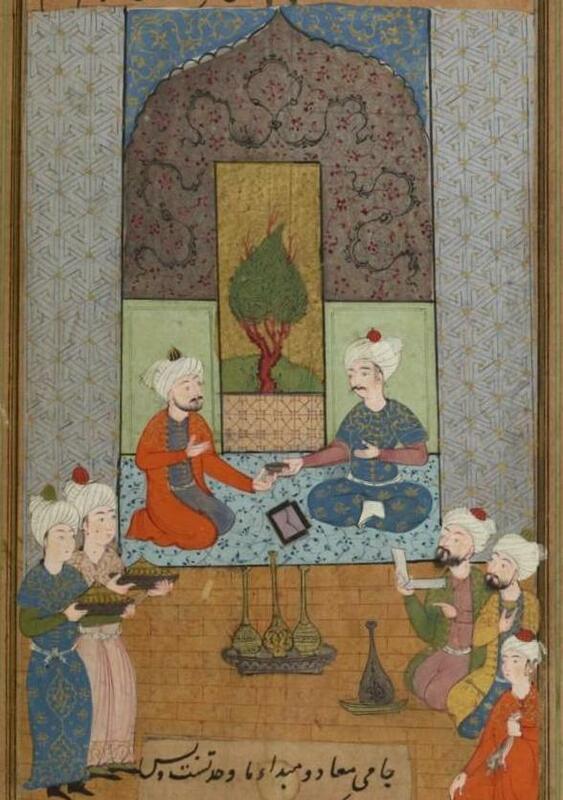 Under the rule of Sult̤ān Ḥusain Bāyqarā (1438–1506), literary figures benefited from the patronage of the royal court, which both provided them with the opportunity to write as well as a venue in which to spread their works. It is only recently that a few scholars—such as Paul Losensky or Ehsan Yarshater—have tentatively recognized that these authors consciously contributed to the shaping of late classical Persian literature. Yet, still following Edward G. Browne or Jan Rypka, most scholarship continues to disregard Timurid literature and consider the literary production of this period as repetitive, unnecessarily complicated, and lacking originality. The first purpose of this project will be to reassess the intellectual legacy of Timurid writers, through one author in particular. A very famous, though not so well-known, example in the realm of Persian studies is the polymath ‘Abd al-Raḥmān Jāmī who has been called since the early sixteenth century by the Prophet’s title: khātam al-shu‘arā, or “the seal of poets”. During the last decades, the culture of Timurid Central Asia has been the primary subject of several publications and dissertations that have made impressive contributions toward a better understanding of the phenomenon that took place during this period. The architecture, pictorial art, political culture, and society—as well as individual figures—have been the object of insightful analysis and provide an excellent synchronistic picture of this era. Nevertheless, another phase of research must be inaugurated: the study of the long-term consequences of the spread of Timurid culture during the centuries that followed and until the dawn of the colonial period. The latter historical moment surely did not mark the end of Timurid culture as a source of inspiration for other, sometimes extremely remote, Muslim societies, far from greater Khorasan. Given the immense amount of material expressing the Timurid cultural influence at this time, our project will focus on a period starting in the fifteenth century and ending in the nineteenth century. A major aspect of the spread of literature produced in Herat during the fifteenth century is the stunningly rapid circulation of texts in the remotest corners of the Muslim world. Because of this, Timurid texts provided the emerging Muslim societies during the early modern period with new tools to deal with various issues, such as the rethinking of ancient literary forms, multilingualism, religious cohabitation, readings and interpretations of fundamental Islamic texts, or political philosophy. An example is the key role played by Jāmī’s writings in the success of Naqshbandi Sufis throughout the Dār al-Islām as early as the sixteenth century: hundreds of copies of the didactic treatise entitled Lawā’ih were produced and many have been preserved in court libraries or religious institutions. This “Sufi bestseller” was even introduced to China in the eighteenth century through Liu Chih’s Chinese translation. The Persian hagiographical dictionary of the Nafaḥāt al-Uns opened up new sources of knowledge and transmission: while Jāmī’s original collection reclaimed the entire Sufi tradition in the name of the Naqshbandiyya order, Ottoman and Chaghatay versions authored by, respectively, Lāmiī Çelebi and Nawā’ī ensured the continuity of the masterpiece in the Turkic-speaking world. The project A Worldwide Literature: Jāmī (1414–1492) in the Dār al-Islām and Beyond is an attempt to gather in one place a wide array of specialists dealing with the reception of a luminary of this period: ‘Abd al-Raḥmān Jāmī. We will provide an analysis of the reception of his works, not only in the Persian-speaking and -writing circles, but also in traditions using other languages as a means of literary expression. Jāmī’s works have been translated, imitated, adapted, commented on, and quoted in an impressive number of languages during the pre-modern and early modern periods. He may appear as one of the most widely read authors in Eurasia during the fifteenth through eighteenth centuries. Contributions on the reception of other contemporaries of Jāmī, such as the scholar Wā‘iz Kāshifī or the political figure, Sufi, and bilingual poet (Chaghatay and Persian) Nawā’ī will also be part of the project.Ultimately, at a more theoretical level, we hope to study the “Jāmī phenomenon” in the light of what Hans Robert Jauss called an ‘aesthetic of reception’ (Rezeptionsästhetik), that is, an approach which considers that literature is not only a social product but also a producer of society. If the poet is a typical representative of the Timurid court culture, his language, his style, and his views and values left a deep imprint on Muslim communities. Concretely, our aim is to bring together specialists of various languages such as Persian, Arabic, Turkish (Ottoman and Chaghatay), Sanskrit, Pashto, Urdu, Bengali, Chinese, Malay, and Georgian, in order to study the impact of Timurid literature on intellectual history at a global level. First, we plan to organize a symposium at the University of Chicago, in order to introduce each other to the material available in each tradition and define guidelines for a common analysis of this complex subject. Then, after a year of further research, an international conference will be held to present the outcome of this collaborative work. The final aim of the project is to publish a volume gathering the contributions of all the participants. The volume will include analytical and theoretical sections, as well as annotated translations of relevant excerpts of texts originally written in the various languages mentioned above, which will be made available to the English readership for the first time. Such a volume would become a unique reference for the study of the reception of Jāmī and the Timurid intellectual legacy. M. Szuppe, Entre Timourides, Uzbeks et Safavides : questions d’histoire politique et sociale de Hérat dansla première moitié du XVIe s., (Paris: Association pour l’Avancement des Études Iraniennes, 1992); M.E. Subtelny, Timurids in Transition: Turko-Persian Politics and Acculturation in Medieval Iran (Leiden- Boston: Brill, 2007). P. Losensky, Welcoming Fighānī: Imitation and Poetic Individuality in Safavid-Mughal Ghazals (Costa Mesa: Mazda Publishers, 1998); E. Yarshater, “Persian Poetry in the Timurid and Safavid Periods,” in Cambridge History of Iran, vol. 6 (Cambridge: Cambridge University Press, 1991). The Prophet of Islam is called “the seal of prophets”. 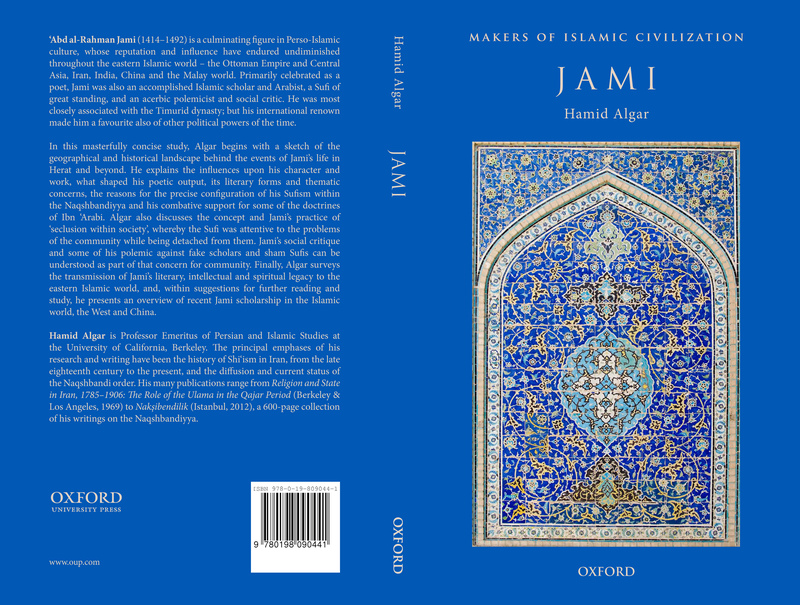 See for instance these two recent dissertations devoted to Jami’s life and works: Ertuğrul I. Ökten, “Jāmī (817–898/1414–1492): his biography and intellectual influence in Herat” (Chicago: The University of Chicago, 2007); Farah Fatima Golparvaran Shadchehr, “Abd al-Rahman Jami: ‘Naqshbandi Sufi, Persian Poet’” (Columbus: The Ohio State University, 2008), Chad G. Lingwood, “Jami’s ‘Salaman va Absal’ as an esoteric mirror for princes in its Aq Qoyunlu context” (Toronto: University of Toronto, 2009). F. Richard, “Un cas de ‘succès littéraire’ : la diffusion des œuvres poétiques de Djâmî de Hérât à travers le Proche-Orient,” in Le livre persan (Paris: Bibliothèque Nationale de France, 2003), 61–77 ; Th. d’Hubert, “La réception d’un succès littéraire persan dans les campagnes du Bengale: une traduction de Jāmī par le poète Ābdul Hākim,” Bulletin d’Études Indiennes 24–25 (2007): 121–138. S. Murata, Chinese Gleams of Sufi Light (New York: State University of New York Press, 2000). On the historical background of the relationships between the Timurids and Ming China, see R. Kauz, Politik und Handel zwischen Ming und Timuriden (Wiesbaden: Reichert, 2005). H. Algar, “Jāmi and Sufism,” Encyclopaedia Iranica XIV: 475–479. A. Papas, “La makhfî ‘ilm ou science secrète de ‘Alî Shîr Nawâ’î : le projet d’une langue mystique naqshbandî,” Journal d’histoire du soufisme 3 (2002): 229–255. H. R. Jauss, Towards an Aesthetic of Reception, trans. T. Bahti (Minneapolis: University of Minnesota Press, 1982).